Where Dream-Arts and Higher Education are Linked. In this seminar or course you will learn about and experience perspectives from many different cultures on dreams, including the current scientific paradigms. Lecture and discussion formats, as well as experiential group and individual activities. Wear comfortable clothing you can move in. Together we will cultivate a respectful space for dream exploration. 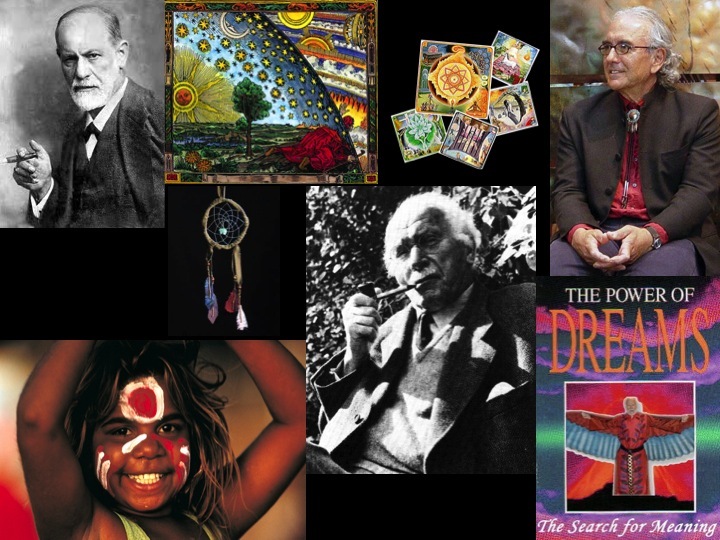 This unique course includes four intensive Sunday Dream Circles based on the work of Kilton Stewart Ph.D., originally inspired in the 1930s by his work with the Senoi Temiar tribe in Malaysia. Dream Expression Assignments will be individually discussed and chosen to match the interest and/or talent each person has within a chosen arts discipline (the process of “dream-bridging”). There will be three Friday evening Dream Expression showings of your artistic work. This connects individual work back to the community and completes the “bridge.” Included early in the month to get your creative juices flowing: a Saturday evening Dream Salon, in which a variety of art forms will be shared by all, on a specific dream theme. This course addresses lucid dreaming as a gateway to lucid living, and vice versa. We will explore LD literature, LD exercises, share lucid dreams, and have lucid discussions. Courses or seminars may be designated specifically for beginners, advanced lucid dreamers, or mixed levels of LD experience. This seminar or course is specifically for professional artists (all fields and domains) wanting to learn more about dreams in order to feed creative inspiration in your work. Mixed groups or specific groups may be designated. Dream-Arts exercises and activities will be tailored to fit the specific needs and interests of your group. This seminar or course offers various methods of dreamwork and dreamplay for both individual and group work. Lecture and discussion formats, as well as experiential group and individual activities. Wear comfortable clothing you can move in. Together we will cultivate a respectful space for dream exploration, and you will gain valuable new tools for your practice. This seminar is for anyone wanting to go more deeply into the "Ullman Method" of dream sharing that was innovated and popularized in the United States by Montague Ullman, M.D. and has continued to be taught at morning dream tables at Saybrook University by Stanley Krippner, Ph.D. The prerequisite for this seminar is either: Dreamwork, Dreamplay, or Senoi Inspired Dream Circle & Creative Dream Expression. Courses and seminars tailored for your group. • Dream-Arts courses and seminars are taught by Dr. Angel Morgan, ph.d. in Ashland, Oregon, or at your location. For your location: all facility fees, travel expenses, and lodging for Dr. Morgan must be covered in advance by you in addition to course fees listed. • some (18+) courses and seminars may be arranged to meet on Zoom.us. Excluding courses requiring movement activities such as dream psychodrama. Seminars and courses on Zoom will require group members to provide their own art supplies before the first day. Lists will be provided as needed.